Arunachal Pradesh Chief Minister Pema Khandu on Sunday attended the annual celebration of ‘Tse Chu’ festival at Khinmey Sangnag Chockorlling Monastery here along with MoS Home Kiren Rijiju, Parliamentary Secretary Jambey Tashi and Tawang MLA Tsering Tashi. The 14th Thegtse Rinpoche Gyurmey Losel Gyatso and monks of the Khinmey Monastery accorded warm welcome to the Chief Minister, MoS Home and other dignitaries on their arrival at the Gompa. 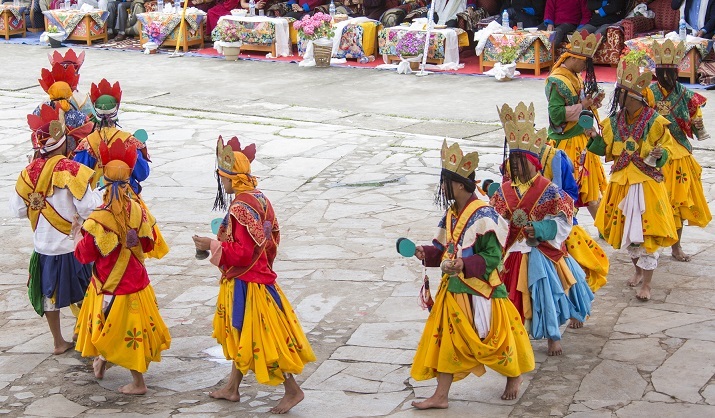 The celebration began with the colourful religious dances to commemorate the birth of Guru Padmasambhava or popularly known as Lopon Rinponche. Devotees and followers of Nyingmapa Guru from all over Tawang and West Kameng district gathered at the Khinmey Gompa to attend the celebration attired in their finest traditional dresses and jewelry. Masked dancers performed Cham dances taking on the wrathful and compassionate deities and demons. Astaras or the clowns mimicking the dancers entertained the audience. Chief Minister in his speech thanked Thegtse Rinpoche for inviting him to the festival and said the celebration is a moment to offer thanks to Guru Padmasambhava for blessing the land of Tawang. “On this pious occasion, people from all walks of life cleanse themselves of any misfortune and take this opportunity to accumulate spiritual merits and to attain enlightenment, which is the ultimate goal of Buddhists,” Khandu said. Rijiju in his speech said the purpose of any religion is to bring out the goodness in the people. He said the occasion provides us the opportunity to imbibe the teachings of Lord Buddha in our daily life to lead a disciplined life and be compassionate towards every human being. Thegtse Rinpoche in his speech said Lord Buddha was the one who had overcome five poisons – ignorance, jealousy, desire, attachment and anger. He also said all should be devoid of jealousy for the benefit of the entire society and work together for peace and harmony.